Last year, ePIPE participated with Providence Water in Rhode Island on a program of in-place rehabilitation of lead water service lines using the patented ePIPE technology. Coating Technologies”. The report recommends coating of lead service lines (LSL’s) to be considered an option to replacement. This study was jointly funded by the Water Research Foundation (WRF) and the U.S. Environmental Protection Agency (EPA). Click here to view a summary of the report. 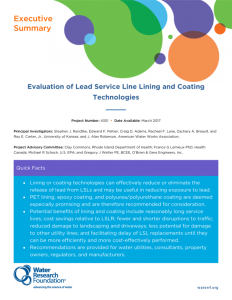 Recently ePIPE urged the reviewers of the USEPA, Lead and Copper Rule to consider the inclusion of proven rehabilitation technologies as an effective program to tackle the lead leaching problems associated with LSL’s. 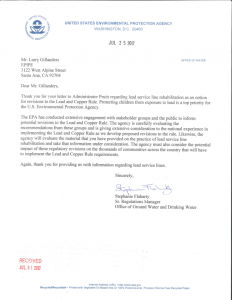 Click here to view the letter from ePIPE to the USEPA and the USEPA’s response. Concerned about lead in your drinking water? We urge you to contact your State Senator, local Congressman and the USEPA to share with them your concerns.